The section reproduced here is from my page about the Geneva watch case making company of François and Louisa Borgel. A hunter or “savonnette” watch has a metal lid over the crystal and dial to protect them. I am certain that the Borgel company never produced a hunter case, but the Goldsmiths & Silversmiths Company, Ltd. advertised Borgel cased watches with hunter lids throughout the Great War. The advertisement from 1916 reproduced here shows a typical watch with a solid hunter lid hinged at 12 o’clock; The only screw-case watch with an attached cover. A watch with a metal lid that fully covers the dial is called a "full hunter". Later Goldsmiths and Silversmiths advertisements showed a watch with a circular crystal in the centre so that the time could be read without opening it. This design is called a half- or demi-hunter and is said to have been originated by Napoleon, who got so frustrated with having to keep opening the case of his full hunter watch to read the time that he took out a knife and cut a hole in the lid. But if the Borgel company in Geneva didn't make hunter cases, what's going on here? The watch without question has a Borgel case - the advertisement says that ... it is contained in a one-piece solid silver screw case that makes it dust and damp proof. This is undoubtedly a Borgel case, no one else was making a case of this description at the time, but how does it come to have a hunter lid, described in the advert as a patent cover to protect the glass? The advertisement refers to Patent No. 11376/15, a British patent filed on 6 August 1915 and granted on 27 January 1916 to "Percy Harman Ball, manager, and the Goldsmiths & Silversmiths Company Limited". The patent doesn't mention Borgel by name but does say that the invention is specially applicable to watches wherein the movement screws into the case from the front - clearly a Borgel screw case - and continues Such watches are particularly suitable for use in exposed places, as the back not being made to open, dirt or moisture can only enter at the front and this is well sealed by the close fitting of the bezel against the case when the movement is screwed home. The added cover then protects the glass from damage, and has a further use for war purposes in that it can be dulled and thus the reflection from the glass which is likely to attract the notice of enemy snipers is prevented. The patent notes that screw cases are not normally made as hunters because a hinge attached to the case would interfere with screwing the movement in, but that the patent design overcomes this by attaching the hinge to the bezel. The patent holds the answer to how Borgel watches came to be fitted with attached hunter lids; the lids were fitted in England to the order of the Goldsmiths and Silversmiths Company after the watch had been imported from Switzerland. NB: Don't confuse the "Goldsmiths & Silversmiths Company, Ltd." with "The Goldsmiths' Company", the London guild of goldsmiths which has operated the London Assay Office since 1300. The Goldsmiths & Silversmiths Company was a company of retail jewellers and silversmiths established in 1880, converted into a limited liability company in 1898, and in 1952 merged with Garrard & Co. Ltd., the Crown Jewellers. How many of these conversions of standard open face Borgel screw cases to hunters were performed is difficult to estimate, I have to date seen only a few compared to a large number of surviving Borgel cased trench watches. 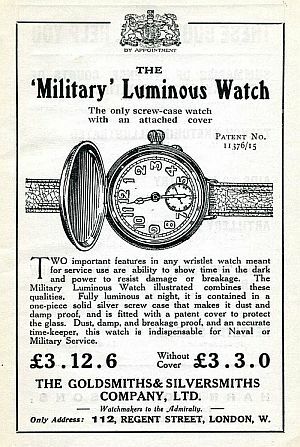 I would imagine that not very many were made; it added cost to what was already an expensive watch, and it doesn't seem very necessary - a detachable shrapnel guard could easily be added to a standard watch if required - and Unbreakable or "UB" crystals made of celluloid became available in 1915 or early 1916, making additional protection unnecessary. The add on hunter lid was also not a very good design from a durability view point. The land cut into the bezel is a reasonable size, but the hinge has to be very small, a consequence of the small size of the wristwatch case, and it has only three knuckles; two on the lid and one on the case. Such small hinges are suitable if they are not to be used very often, but with constant opening of the hunter lid to read the time this hinge wouldn’t have lasted very long. The added cost was also significant. The advert gives a price of £3.12.6 for the watch with a hunter lid, and £3.3.0 for the same watch without a cover, so the extra cost of the cover was a quite significant nine shillings and sixpence. But the major problem with a full hunter wristwatch is that to read the time you must use your right hand to open the lid as well as using your left arm to bring the watch into sight. This rather defeats the object of the wristwatch as a device that can be easily read by moving one arm while leaving the other hand free. The demi-hunter style with a small crystal in the centre of the lid improves the watch in this area, and certainly by 1918 Goldsmiths and Silversmiths ads were showing demi-hunter wristwatches. This of course defeats one of the objects of the patent, to provide a metal lid that can be dulled to avoid attracting the notice of enemy snipers. This naturally isn't mentioned in the adverts for the demi-hunter version, and I don't think the claim that reflections from wristwatches attracted sniper fire has ever been shown to be a significant concern. Of the few watches with this feature that I have seen, there are more demi-hunter than full hunter versions. All in all, this was a rather obvious idea that wasn't really needed, which explains the small number of such conversions seen. Sometimes things are rare simply because they were not a good idea rather than for any other reason.